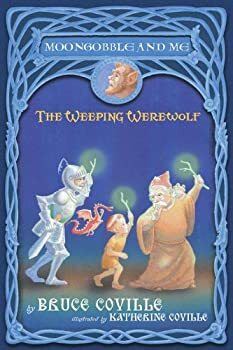 Bruce Coville writes fantasy, science fiction, and horror for children. He writes the well-known Alien series (e.g., My Teacher is an Alien). He also writes a series of re-tellings of William Shakespeare’s plays for kids. Bruce Coville’s books are availabe in audio formats. Learn more at his website. 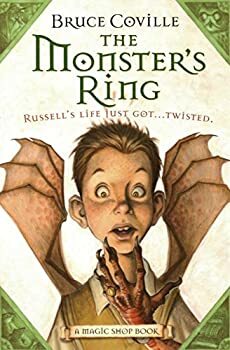 Outside the US, The Monster’s Ring may be published as Russell Troy, Monster Boy and The Skull of Truth may be published as Charlie Eggleston’s Talking Skull. Note: This book is titled Russell Troy, Monster Boy in some markets. For kids that are too young for the complexity of the HARRY POTTER series, and yet still interested in fantasy stories, Bruce Coville's MAGIC SHOP books might be the thing to hook them up with. Five in total, each one revolves around a simple premise: a young child with the usual kid problems (home trouble, bullies, crushes, angry teachers, etc) stumble across Mr Elives' Magic Shop, and leaves with an unusual purchase which initially creates more trouble for them, but ultimately teaches them important lessons. For kids who are too young for the complex Harry Potter series, and yet interested in fantasy stories, then Bruce Coville's Magic Shop books might be the thing to hook them up with. 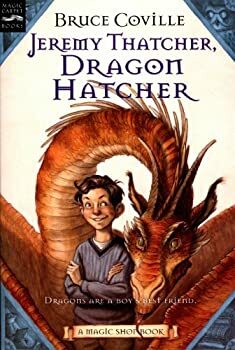 Each book is based on a basic premise: a young child with the usual kid problems (home trouble, bullies, crushes, angry teachers, etc) stumble across Mr Elives' Magic Shop, and leave with an unusual purchase that creates more trouble for them, but ultimately teaches them important lessons. This may well be my favourite of the MAGIC SHOP books, a series of standalone stories that feature a young boy or girl entering Mr Elives' Magic Shop and leaving with a strange artefact of some kind — one which will have taught them an important life-lesson by the end of the book (though not before causing them a heap of trouble in the interim). The Unicorn Chronicles — (1994-2012) Ages 9-12. A Glory of Unicorns is a collection of stories. The Unicorn Treasury is a collection of stories and poems. Publisher: This is the magical story of Cara, a girl sent on a mission by her grandmother to the land of the unicorns. Only Cara can protect the unicorns and their world from invasion. I had just finished reading THE HUNGER GAMES trilogy and was in search of something lighter to read — and what could be lighter than a book about unicorns, right? Well, Into the Land of the Unicorns is squarely aimed at a seven-to-ten year old reading range, but it manages to have a certain level of depth and darkness that certainly elevates it above the usual "rainbows and candy-floss" favour that usually surrounds the subject of unicorns. 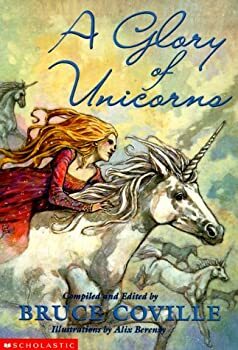 This is the second book in THE UNICORN CHRONICLES, a four part series by children's author Bruce Coville, which also includes a short story to be found in the unicorn-themed anthology A Glory of Unicorns. In the first instalment, Into the Land of the Unicorns, Cara Hunter was transported via an amulet into Luster, the world into which unicorns fled when Earth became too unsafe for them to inhabit. Due to a tragic misunderstanding centuries ago, the Hunter family has made it their legacy to hunt down and destroy all the unicorns. 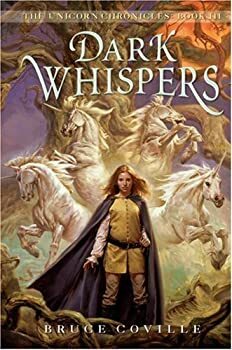 Cara's long-lost father is among them, and so Cara has a very personal stake in her desire to protect the unicorns from all those who wish them harm. 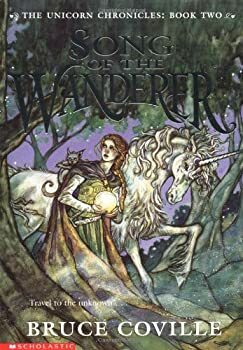 The third book in THE UNICORN CHRONICLES by Bruce Coville continues Cara Hunter’s journey through the land of Luster as she attempts to find a way to defend the unicorn population from an ancient feud involving her own family members. 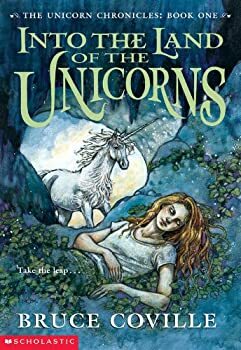 After discovering her heritage as the descendant of a woman who is cursed with eternal life due to the unicorn horn trapped within her heart (and therefore determined to drive them to extinction), Cara agrees to a mission given to her by the Queen of the Unicorns. In the Unicorn Chronicles there is a prophecy that states: “In the darkest hour, of their darkest day, the unicorns must face, their own darkness,” as well as a few veiled clues to something called the Whisperer. Cara’s task is to seek out the centaur king in the hopes that he has more information about what all this means. 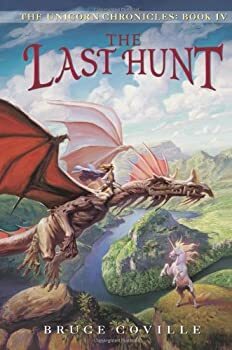 The fourth and final book in Bruce Coville’s THE UNICORN CHRONICLES was published nearly twenty years after the first came out, and it appears that Coville sought to make up for this delay by making The Last Hunt more than six times thicker than Into the Land of Unicorns. Moongobble and Me — (2003-2008) Ages 9-12. Publisher: Edward is bored with life in the little town of Pigbone. Then Moongobble the Magician and his faithful toad, Urk, move into the cottage on the hill. Soon Edward has a job helping Moongobble. And Moongobble needs a lot of help because it turns out, he is not a very good magician. (His spells keep turning things into cheese!) Edward has never been so busy — or so happy. But then someone threatens to stop Moongobble from ever casting another spell. Edward can’t let that happen. He’ll do anything to save his friend’s magic — even face the deadly, dreaded Dragon of Doom! 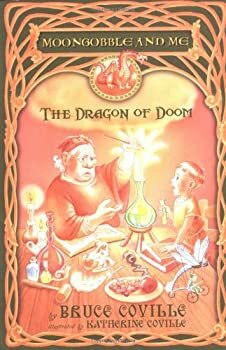 Funny and suspenseful, spiced with Bruce Coville’s special brand of wackiness and Katherine Coville’s warm, witty illustrations, this book is sure to cast a spell of delight on beginning readers. When Moongobble the magician moves to town, Edward is eager to become his new apprentice. It turns out, though, that Moongobble isn’t much of a magician after all — every time he tries a spell, he ends up turning something into cheese. In fact, he’s about to lose his authority to practice magic if he can’t prove himself proficient by completing three difficult tasks. 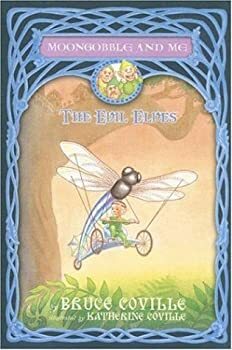 The first task is to steal some special acorns from the Dragon of Doom, so Moongobble and Edward set off with Urk, the pessimistic talking toad, and the Rusty Knight, who’s nearly deaf, to find the dragon’s cave. Moongobble has been assigned his second task to prove he should be a magician: he must get a bottle of tears from the dreaded Weeping Werewolf who lives alone in the forest. Fortunately, Edward, Urk the toad, the Rusty Knight, and Fireball the Dragon are willing to help. When they find the Weeping Werewolf, everyone is in for a big surprise! This charming little series of short children’s novels, beautifully narrated and enhanced with cute sound effects by Full Cast Audio is the perfect way to spend an hour with a child on a Sunday afternoon. My daughters and I have enjoyed them immensely. Moongobble has successfully (sort of) completed two of his three tasks to prove that he deserves to be a magician. His third task is to retrieve a jewel called The Queen’s Belly Button, which has the power to turn its owner evil, from the elves who stole it. The elves, who used to be peaceful creatures, have been badly influenced by the Belly Button and they do not want to give it back. Edward et al. once again set out with Moongobble to help him get the jewel. It’s obvious by now that Moongobble always needs help because every time he attempts a magic spell, he is still turning things into cheese. Will Moongobble, Edward, and the rest of the gang be able to resist the temptation of the Queen’s Belly Button? 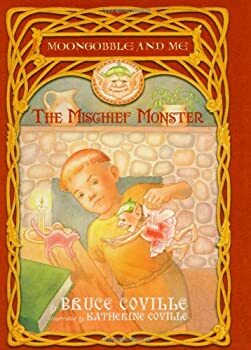 The Mischief Monster is the fourth book in Bruce Coville’s delightful MOONGOBBLE AND ME series for ages 9-12. I’ve been listening to this series of short books on audio with my girls who are 6 and 9 years old. Each book is about an hour long and dramatized by Full Cast Audio, which means there’s a cast of readers playing parts rather than just one narrator. In The Mischief Monster, Edward, Moongobble, and their friends try to return a mischievous monster princess named Snelly to her home in Monster Mountain. As usual, there’s a surprise twist at the end. The plot of The Mischief Monster is cute and funny (especially when Urk the toad gets turned into a fluffy pink kitty). My girls loved the story. Bruce Coville’s Chamber of Horrors — (1985) Ages 9-12. Publisher: Trusted by her fascinating Aunt Zenobia to care for an ancient amulet, Marilyn Sparks is transported to a demonic world in which she must fight an ancient curse, a tragic demon, and a thousand-year-old blood war. Nina Tanleven — (1987-2011) Ages 9-12. Publisher: The Stage is Set… For a Ghostly Scene! For sixth-grader Nina Tanleven, trying out for a part in a play is pretty scary. But nothing can compare to seeing a ghost, a woman in white, sitting in the audience! Nina senses that she has nothing to fear from this apparition, but she is intrigued. Nina learns that fifty years ago, a beautiful actress was murdered–on this very stage! According to legend, she has haunted the theater ever since…. Strange things begin to happen — scripts are ripped up, sets are knocked down, a costume is torn to pieces — and everyone thinks that the ghost wants to stop the show from going on. Everyone, that is, except for Nina and her best friend, Chris, who decide to do some ghost hunting of their own. But only the Woman in White can lead them to the answer! Find more by BRUCE COVILLE. Beth Johnson Sonderby brings us this week's Why You Should Read... On the face of it, Beth has written a love letter to Bruce Coville but, honestly, this is really an essay on why we should all read -- enjoy! I’d like to share a story with you. It’s a rather personal story, but I want to share it anyway. Because I think sometimes we forget what an amazing thing it is, that unique bond between writer and reader, between reader and story. We invest a lot of time in reading because we enjoy, because it’s entertaining and because, sometimes, we find something that means more to us than we ever imagined it could.